With the collapse of the Soviet Union in 1989, and the ongoing American embargo of Cuba that began in the 1960s, Cuba suffered an economic crisis, which put food security at risk for the most vulnerable populations. That’s when the Cuban government encouraged the churches to get involved. The Cuban Council of Churches (CCC) launched the Sustainable Development Program and PWRDF got involved, providing support for the SDP’s many initiatives. Among those initiatives was training church and community volunteers in food production and preservation (aka canning). Volunteers trained by the SDP then returned to their individual communities to pass on this new knowledge of food production and conservation. One farmer, Roberto Chavez, received agricultural training that enabled him to establish a farm on the roof of his family home – a highly functional “green roof” that not only supports a fruit and vegetable garden, but also raises animals, an important protein source for his family. The project has been so successful that the Chavez family harvest surpasses the family’s needs and they are able to sell surplus to other households. 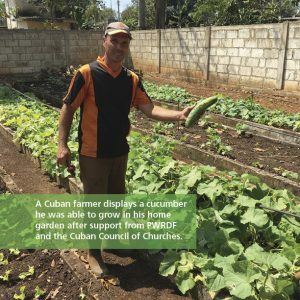 As part of PWRDF’s food security campaign, in March 2015, a PWRDF delegation to Cuba encountered people of faith engaged in and passionate about “the care of creation and community” through their rural and urban food growing initiatives.